"The unique flavor of basmati rice and the rich nuttiness of roasted corn are highlighted by fresh lemon juice and basil in a salad that's always a crowd pleaser at our summer barbecues. This salad is best served well chilled." In a medium pot, bring the basmati rice and water to a boil. Reduce heat to low, cover, and simmer 20 minutes. Preheat oven to 400 degrees F (200 degrees C). In a bowl, toss the corn kernels with 3 tablespoons corn oil. Spread the corn on a large baking sheet. Bake 15 minutes, stirring occasionally, until lightly browned. remove from heat, and cool. In a bowl, mix the lemon juice, red wine vinegar, 1/2 cup corn oil, sugar, basil, salt, and pepper. 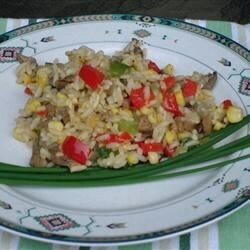 In a large bowl, toss together the cooked rice, cooked corn, tomatoes, corn oil mixture, red onion, and green onions. Cover, and chill at least 1 hour before serving. This is an excellent side! The only thing I disagree with is the chilling part. It is so good at room temp! Thanks! I stuck pretty exactly to the recipe and took for a picnic with cold meat and it was raved about (spring breakers!) - very refreshing. Was very good next to grilled chicken breast with cucumber and pepper relish.